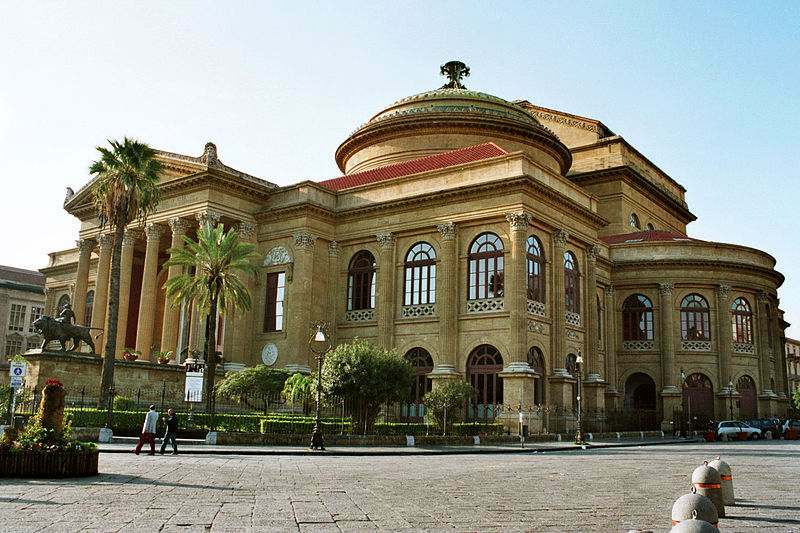 Born in 1897 after twenty years building, Massimo Theatre is without any doubts one of the symbols of Palermo. In this city, as it’s known, there are a lot of great historical monuments to discover. But Massimo Theatre has very few competitors aroun the world! Theatre’s building started in 1864 by Giovanni Battista Filippo Basile and finished by his son Ernesto. They both were two of the best and famous architects in Italy. Thanks to its 7730 square meters, Massimo Theatre is nowadays the biggest lyric theatre in Italy and the third in Europe. Over the great dimensions of the building, Massimo Theatre is unique thanks to its neoclassical architectural beauty with its columns, arches and windows. For all these reasons, Massimo Theatre is the most appreciated monument in Palermo: tourists love taking picture of the Theatre and share the pictures on social media, capturing also one of the most mysterious italian quote. L’arte rinnova i popoli e ne rivela la vita. Vano delle scene il diletto, ove non miri a preparar l’avvenire. Impossible to translate, but it easy to explain its meaning. This sentence is full of wisdom and deals with the importance of art: it restores people and reveals their life, but it’s vain if it’s used just to “have fun”. The epigraph suggests to use art to prepare ourselves to face up the future: art inspires our lives giving precious advices to help us growing up. The mystery of this sentence turns around a question: who is its father? A lot of historians tried to understand who gave birth to this quote but nowadays, after more than one hundred years, it still remain a mystery. Someone says that the owner was Francesco Paolo Perez (Palermo’s mayor from 1876 to 1878), other people say that was Camillo Finocchiaro Aprile (one of the most important italian jurist of those ages). In 70’s, a spectator who used to attend the shows in Massimo Theatre supposed that the father of the epigraph was the same architect who started the construction: Giovan Battista Filippo Basile. The statement hadn’t any reliable source, that is the reason why we can’t attribute the epigraph to the architect. Also Luigi Pirandello and Andrea Camilleri took part into this “Sicilian mystery” but there are no proof for the first one, while for Camilleri it’s totally impossible just because in 1897 he wasn’t still born. Even if the historian Rosario La Duca recently tried to clarify the issue, nowadays there is not an epilogue. The mystery still goes on to fascinate tourists and passers-by. After all, perhaps, it’s better to keep the mystery!